Books are a year-round pleasure in this house. I always have a bedside pile (okay, tower) of books I am currently reading, and I read aloud to my children (yes, even my twelve-year-old) nearly every day. But something happens to my book love when we feed the last of the porch pumpkins to the chickens and go in search of our Advent wreath. Perhaps it’s the early darkness and cold and all those hours to fill indoors. Perhaps it’s the discipline of Advent observance. Perhaps it’s the anticipation of Christmas. Maybe it’s because I am buying so many books to give as gifts. Or, maybe it is for every one of these reasons. However I account for it, our December days are marked by the turning of pages. During Advent, my reading takes on a heightened focus. I don’t read anything “just because.” For instance, this is the month when I reread Winter Solstice by Rosamunde Pilcher. I think of this novel, set in snowy Scotland in the days leading up to Christmas, as my version of those sentimental holiday movies so many enjoy this time of year. It’s a great, warm, afghan of a novel, but it’s made of high-quality Scottish wool. Nothing cheap or slap-dash here. Pilcher’s story is full of love and sentiment but never sentimental. I am always so glad to pick it up again. One of our favorite recent read-alouds would make a great stocking stuffer (it really is just the right size! and price!). It’s The Children of Noisy Village by Astrid Lindgren, of Pippi Longstocking fame. I bought this book after enjoying her picture book Christmas in Noisy Village (Picture Puffin) for years. The Children of Noisy Village features the same children but describes their activities not only at Christmas but all through the year on a traditional Swedish farm. It’s a chapter book, but the chapters are brief. It’s pretty much an ideal bedtime read. I think anything Scandinavian is perfect for the Christmas season, but I am recommending this book because my two sons, one a reluctant reader and the other a reluctant reader and reluctant listener, both adored it. The storytelling is simple and so true to childhood. It’s all about food and games, special celebrations and traditions, childish friendships and milestones as momentous as being given the responsibility for shopping at the village store entirely on your own. We finished the book weeks ago, but when my nine-year-old quoted one of the lines from the book last night at dinner, the boys and I were practically rolling on the floor with laughter. I love to read through a daily Advent book and usually alternate between Watch for the Light: Readings for Advent and Christmas and God With Us: Rediscovering the Meaning of Christmas (Readers Edition). But there are so many wonderful, possibilities for a daily devotion. This would be the perfect time of year to begin one of my favorite books, Madeleine L’Engle’s The Irrational Season (The Crosswicks Journal, Book 3) . The Jesus Storybook Bible: Every Story Whispers His Name has exactly twenty-four stories from Old Testament beginning to the birth of Jesus and makes ideal Advent reading with small children. I have also enjoyed Ann Voskamp’s beautifully illustrated Advent devotional Unwrapping the Greatest Gift: A Family Celebration of Christmas with my older kids. I know that for many, December begins with a Christmas tree. We won’t cut down our tree for a few weeks yet, but our anticipation begins when I pull out our collection of Christmas storybooks. I’ll gather those books from a shelf in the third floor-closet on Sunday afternoon (something that will require at least four trips up and down those narrow, old stairs) and tell you about a few of them next Saturday. If you have small children or grandchildren, Advent is the perfect time of year to begin a Christmas picture book collection. I’ve included amazon affiliate links in this post, but one of my favorite sources for beautiful, meaningful holiday books is Chinaberry. When my kids were small, I began buying two or three Christmas books each year (I found many of them at our local thrift store) and that collection is now my very favorite thing to pull out each year. Better even than the familiar tree ornaments made with macaroni and glitter. Farmer Boy, by Laura Ingalls Wilder, is one of our favorite family books no matter the season. Over the summer, our family visited the original Wilder homestead in Malone, NY. I recently wrote about that visit (and so much more) for Art House America. You can read all about my harvest of memory right here. Oh, me too! 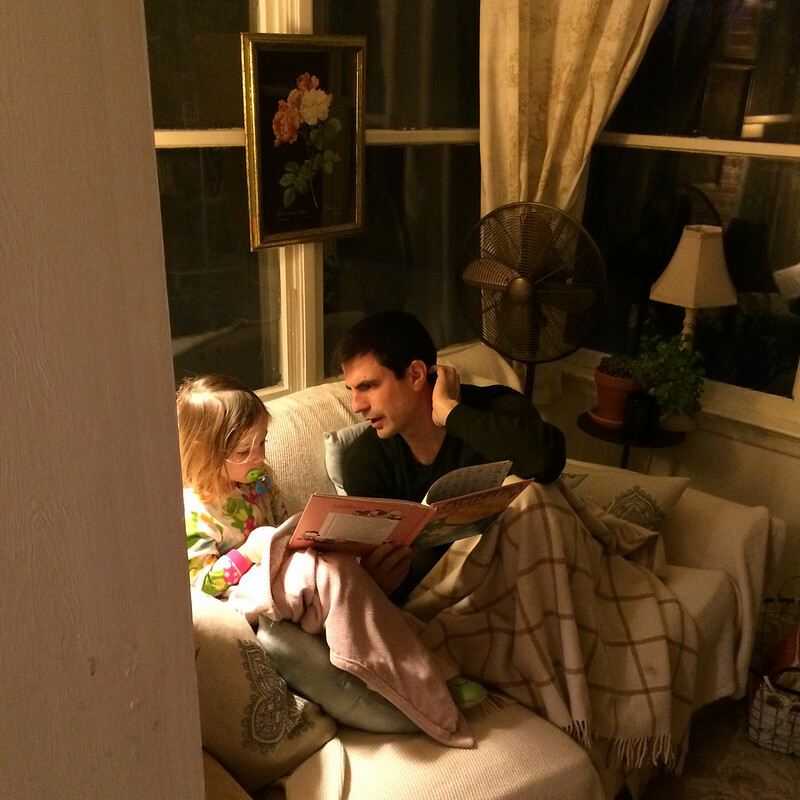 I love reading to my children all the year long, but at Christmas I go crazy. I haven’t pulled out the Christmas books yet, trying to wait until December 1st, and I’ll be also putting in a large book reserve at my library so we can reread all our favorites. And thanks to you, I’ll be adding a few more books to my pile. Oh Christie, I thought perhaps I was the only one who read Winter Solstice every Christmas! Isn’t it wonderful? I also read Jan Karon’s Shepherd’s Abiding. It’s short, sweet and so lovely. I’ve enjoyed Jan Karon in the past but haven’t read Shepherd’s Abiding. I’ll look for it. Thank you, Linda! “Watch for the Light” has been on my list for a while now, along with “Bread and Wine.” I really need to buy them! With the kids this year we’re reading “Jotham’s Journey.” We started it today at lunch and lit the first advent wreath candle. I enjoyed Ann Voskamp’s book for two years (the one for adults) but this year I’m reading along with She Reads Truth for their Advent reading plan. I also just put “Winter Solstice” on hold at the library. Danielle, I’d love to try Bread and Wine this year for Lent. And I’ll be keeping an eye on your instagram for library book ideas! I’m late to the party, but I also reread Winter Solstice every December! And I pull out Watch for the Light (and the first chapter of The Irrational Season) every year. I also love Shepherds Abiding. Lovely post, Christie. I love Rosamunde Pilcher and get very happy when someone else loves her too. I was going to read Winter Solstice in January but decided to move it up to December thanks to your post. thank you! Your family visited where I grew up. I lived my entire teenage life in Malone, New York and got saved there. I would’ve never guessed that I would have that in common with you. WOW!! !